Yosemite National Park in California is one of the most popular national park destinations in the Nation, averaging more than 9,000 visitors each day throughout the year. 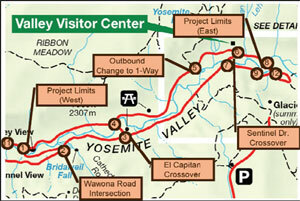 Due to the shape of Yosemite Valley, public access to the park is quite limited. Given the steep terrain around the valley, the only roadways in and out of Yosemite Village are Northside and Southside Drives, both of which are two-lane, one-way facilities with stop-controlled intersections along their length at two bridge crossings. These two key valley roadways are scheduled to be under consideration for a significant repaving and rehabilitation project starting in 2006 and anticipated to finish in 2008. Concern over significant delays in the construction phase led the Central Federal Lands Highway Division (CFLHD) and the National Park Service staff to consider a range of phasing and staging alternatives. Congestion and delays on weekends are already a recurring event during peak travel months even with no roadwork underway. The original role of QuickZone in the Yosemite project was to identify the likely travel delays associated with two competing alternatives: an aggressive one-season approach or a more traditional two-season plan. As the case study progressed however, QuickZone became integral in the incremental refinement of a phasing and staging plan combining advantageous aspects of both alternatives. No final decision about the timing or phasing of the work had been made as of August 2004. However, the time and effort invested in data collection and QuickZone analysis had a marked impact in shaping the planned work to minimize impacts on park visitors while finding effective ways to reduce project duration and costs. CFLHD staff plan to continue utilizing the QuickZone model throughout the Yosemite project life cycle, including the actual construction phase. QuickZone can effectively model complex geometric changes and traffic control by phase, including full closures and a variety of one-way and two-way traffic patterns on the same facility throughout the project. QuickZone helped identify a feasible one-season construction schedule thus reducing both the impact on park visitors and total project duration and costs. Development of an analytical traffic operations model early in the project life cycle motivates use and refinement of work plans in subsequent project phases.